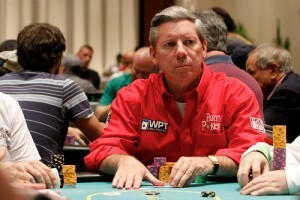 Mike Sexton questioned some of the decisions made by the World Series of Poker in a recent blog post at partypoker.com, prompting a quick response from a WSOP official who thanked Sexton for his input, but defended the way Caesars has handled poker’s most important brand. In the post, Sexton talked about a number of different policies that the WSOP has put into effect over the last few years. One of his biggest targets was the concept of the November Nine: the policy in which the WSOP Main Event plays down to a final table in July, but then uses the next few months to build interest before bringing the players back to determine a winner several months later. Sexton added that while he understands that moving the final table to November was done “for PR and TV reasons,” he would prefer a format that took just two days off before the final table: hopefully, enough time for players to get a little rest and build plenty of buzz, but leaving the continuity of a single event that’s missing right now. Sexton listed the reasons he’s against the November Nine format, including the fact that the WSOP holds onto the remaining prize money for four months, and that players can train, rest and recuperate over that time, thereby disadvantaging players who were best prepared heading into the Main Event. He also said that the format could be highly inconvenient if the wrong player finds themselves in the wrong situation. He then went on to question the importance of the WSOP Europe and WSOP Asia-Pacific. In particular, Sexton questioned whether those events should count towards the WSOP Player of the Year race, and said that perhaps they should not award bracelets outside of Las Vegas. “I’m worried, as the number of events continually grows, the value of each bracelet will diminish,” he wrote. While it was no surprise that the WSOP would respond to comments from such a prominent member of the poker community, the venue for their response was: directly in the comments to the blog post. WSOP Executive Director Ty Stewart wrote a lengthy post defending the direction of the World Series, saying that both business considerations and the future of poker have been taken into account at every turn. Stewart also defended the WSOP’s international events, and pointed out that they would only be holding one of those festivals (WSOP Europe) in Germany this year, rather than two. He concluded by defending Caesars’ record on how the company has treated the WSOP. “In closing, I’d just like to say that [while] we believe we have [the right] to operate a fair business with the WSOP event and brand, we are almost always guided by simple endeavor to do the right things for the right reasons,” Stewart wrote.